Happy Monday! 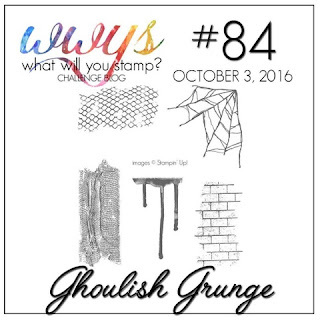 This week over at What Will You Stamp we have been challenged to use the Ghoulish Grunge stamp set from the new Holiday Catalog. I love figuring out different ways to use seasonal or holiday sets so this was a fun challenge for me. Here's my card... can you tell which of the "ghoulish" stamps I used? Yup, I used the blood drips. At least that's what I see when I look at this stamp (am I making myself sound like a serial killer?). I turned the blood drips upside down, stamped them in Bermuda Bay and used the "drips" as stems for flowers. 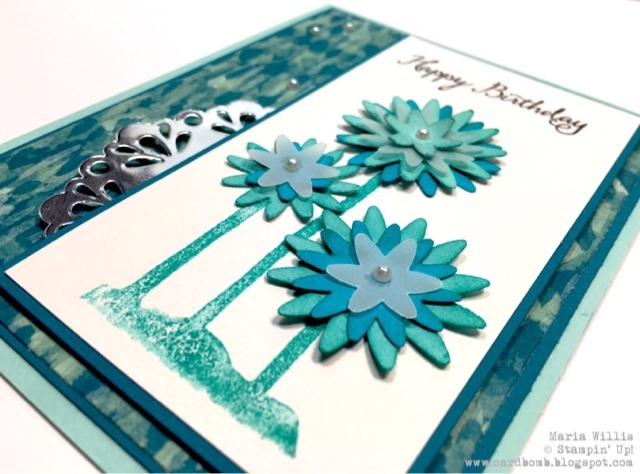 Then I used the Blossom Bunch Punch to punch out flowers in Pool Party, Tempting Turquoise and Vellum. I sponged the flowers with Bermuda Bay ink to create a more monochromatic look and topped the flowers off with pearls. Ghoulish Grunge has some pretty fun stamps in it! 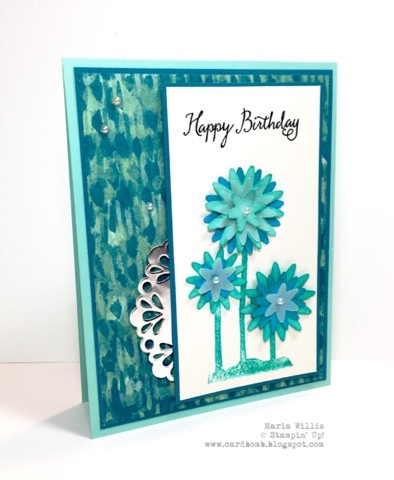 If you have this set please join us for the fun over at What Will You Stamp this week! I can't wait to see what you will stamp! Thanks for stopping by by blog today! See you back here soon! I love how you used your "blood drip" upside down as tree trunks! Very clever!